The Tulip Mini Facelift, or Tuliplift, is a surgical facelift procedure developed by Forever Young's Dr. David Rahimi to be possibly more effective and less invasive than conventional facelifts. This revolutionary outpatient procedure can be combined with other procedures such as chemical peels, laser eyelid surgery, and other laser treatments and is performed under local anesthesia, making it safer by eliminating the risks of general anesthesia. Dr. Rahimi developed this procedure more than eighteen years ago, and since then has been constantly refining it to make it safer and more effective. A facelift is usually a major operation, designed to remove excess skin and fat in the neck, jaw and lower facial area. 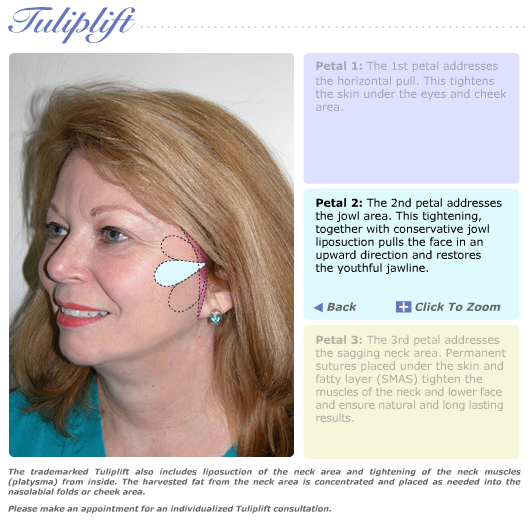 Unlike other popular procedures such as the Thread lift and Featherlift, the Tuliplift actually excises sagging skin, removes fatty deposits from the neck and jowls, and, unlike other popular mini facelift techniques, tightens the underlying tissue and muscle. An initial complimentary consultation will determine the approach to the procedure; bring a photograph of yourself that is 10 to 15 years old. Excess fat is liposuctioned from your neck and jowl area, and the skin and muscles in the neck will be tightened by tucking, or platysmal plication. 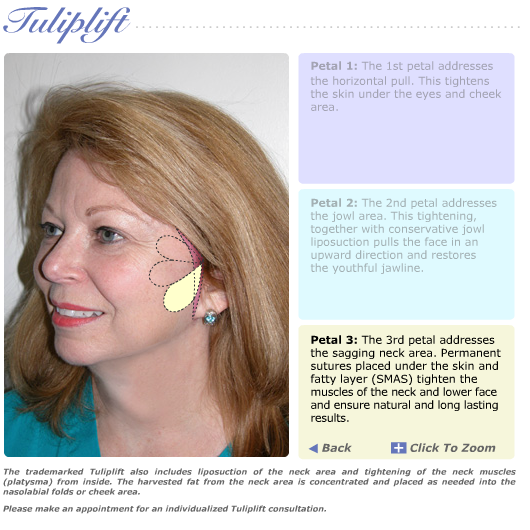 Three Tuliplift 'petals' tighten your skin; one for the eye and cheek area, one for the jowls and jaw line, and one for the sagging neck, where permanent sutures tighten the muscles and ensure possibly long-lasting, natural results. A few weeks later, a laser or chemical peel will be performed to fade any scarring. The results of the Tuliplift can last for years, without making you look pulled or wind-blown. Sutures are removed after seven days, and usually by day 10 you can go back to work and resume social activities. The cost ranges from 15,000 to 25,000 dollars. Individual results may vary, consult your doctor to make sure you are a good candidate for this treatment.